our 12th year anniversary present to ourselves was a few days spent here at Native Winds. It was the perfect cabin, very cozy and felt like home. We needed a place to unwind from our busy lives and two small kids. We are looking forward to many more trips up from Florida. See yall in a couple of years. Thank you so much for letting us stay in this cabin! We had a great time! We went to deep creek, road to nowhere, and went snow tubing! This is a beautiful cabin with an amazing view. IT was nice to sit fireplace. We love this cabin. Very Cozy and quiet It was perfect. It had all the comforts of home. It is in a great location, close to everything. We look forward to coming back again later in the year. Thank you for helping us find the perfect cabin.! Very friendly and helpful as usual! Native Winds is just what my husband and I needed! We wanted a nice cozy cabin so that we could just unwind from life. We celebrated our 23rd anniversary here! We can not say enough about this cabin! Wow is all I could say when we arrived. This place is stunning and the folks of Bryson City and surrounding towns have been nothing but nice! We recommend going to see mingo Falls and go past the bridge totally worth it. Can't wait to come back. We had a fabulous girls weekend. Thank you so much. This definitely a mountain getaway! Beautiful private views all day and night of gorgeous mountains. The hot tub is positioned perfectly to enjoy daytime or nighttime views of the area. Take what you need because you will not want to leave once you get there! Host was very responsive and accommodating. We will definitely use them again! 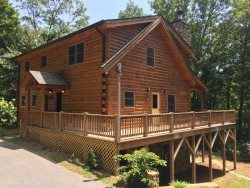 Great Smoky's Cabin is an amazing value. Unbelievable view, exceptional space and proximity to Bryson City is great. Thanks for having us! Great Smokys cabin is an amazing value. Unbelievable view, exceptional space and proximity to Bryson City is Great. Thank you for having us! My husband and I needed a quick getaway. This cabin was perfect. It was very clean, well kept and cozy. We will be back.